Home >> Tobacco with a Cherry on Top? No, Thanks! Tobacco with a Cherry on Top? No, Thanks! 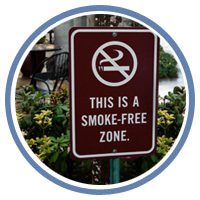 Next week (January 19-25, 2014) is National Non-Smoking Week in Canada, and BCAHL is lining up with others who want to stop new smokers from starting and support smokers who may be read to quit. This year’s theme “Truth in Advertising” highlights the sad fact that our youth are being tricked into starting smoking through flashy packaging, candy-flavours and the lure of Hollywood stars smoking in movies. The power walls are down and so much has been done to ensure that the consequences of smoking are portrayed on packaging, but there is more still to do. The brand is at the core of tobacco industry marketing. When you come right down to it, a cigarette is chemicals, dried leaves and paper. Tobacco companies have only been able to make smoking seem cool, glamorous and sophisticated through aggressive and unethical marketing. Big tobacco continues to find and exploit loopholes in legislation. In 2010, the federal government banned flavoured cigarillos because it found they were being marketed to, and smoked by, youth. But the tobacco companies just changed the filter and increased the size – cigarillos were reclassified as ‘mini cigars’ and with those minor tweaks they are able to circumvent the ban. I can’t imagine that cherry, minty or mocha flavourings would hide the fact that you are inhaling toxins and smoke into your lungs, but then I am not their target audience. It is disturbing that they have targeted youth and seem to be having some success as the smoking rates among young adults is higher than average. BC offers a wide number of different supports for those who are interested in quitting – our friends at QuitNow have all the information available at the click of the mouse or a text to your smartphone. It’s like carrying a support group in your pocket. As January proceeds and you think about your resolutions for the year ahead, it’s a great time to firm up your resolve – you can quit smoking (or never start). When it comes to smoking, there are no benefits to your image, your health or your surroundings, even with a cherry flavor on top.